On September 15, 1968, the United States first celebrated Hispanic Heritage Week, now expanded to Hispanic Heritage Month, ending October 15. This fantastic mural was originally painted by Los Dos Streetscapers (Wayne Healy and David Botello) in 1977. 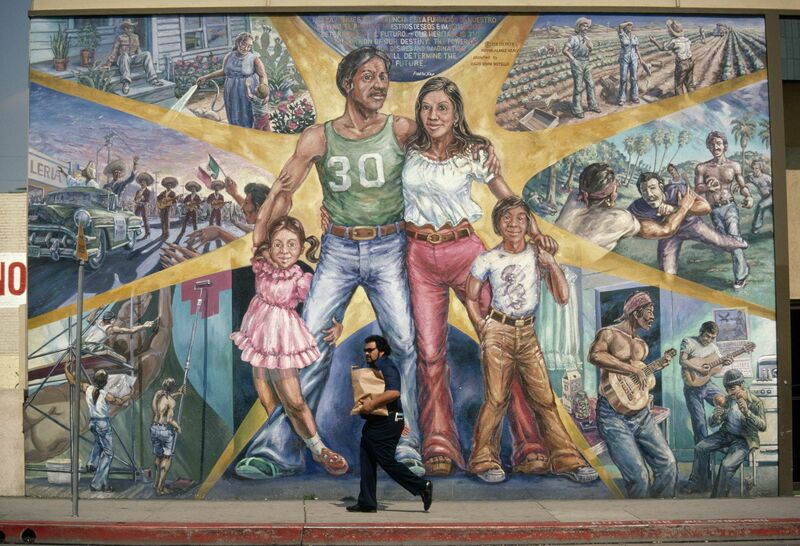 The mural, in the Lincoln Heights neighborhood of Los Angeles, California, depicts the Latino (specifically, Mexican American) experience. On September 15, 1968, the United States first celebrated Hispanic Heritage Week. In 1988, the celebration was expanded to a month. The dates were chosen to honor the independence movement in several Latin American nations—Costa Rica, El Salvador, Guatemala, Honduras and Nicaragua celebrate their independence on September 15; Mexico on September 16; and Chile on September 18. Hispanic Heritage Month honors the contributions of Hispanic and Latino Americans. Hispanic and Latino Americans can have European, African, Asian, and indigenous ancestry. The distinction between Hispanic and Latino is often misunderstood. People with Hispanic origins trace their ancestry to Spanish-speaking countries, such as Mexico or Spain. Latinos trace their ancestry to Spanish- and Portuguese-speaking Latin American countries, such as Brazil. According to the 2010 U.S. Census, Hispanic and Latino groups with the largest populations in the United States are Mexican, Puerto Rican, and Cuban. having to do with people and culture tracing their ancestry to Spanish-speaking nations in Latin America.